One pack, Radical RC Translucent White, 1/2A 1.5mm(.059")ID x 2.5mm(.098")OD x 1 meter(39") Silicone Fuel Line. Finally a small silicone line to replace old time vinyl. One pack, Radical RC Yellow, 1/2A 2mm(.078")ID x 4mm(.157")OD x 1 meter(39") Silicone Fuel Line. Colors Available Blue or Yellow Only. One pack, Radical RC Blue, 1/2A 2mm(.078")ID x 4mm(.157")OD x 1 meter(39") Silicone Fuel Line. Colors Available: Blue or Yellow Only. 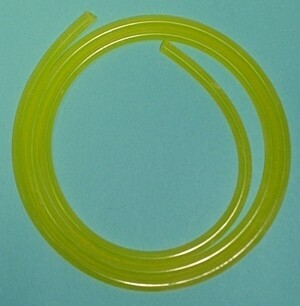 One pack, Radical RC Green, 2.2mm(.087")ID x 5.5mm(.217")OD x 1 meter(39")Silicone Fuel Line. Photo shows colors available only. One pack, Radical RC Orange, 2.2mm(.087")ID x 5.5mm(.217")OD x 1 meter(39")Silicone Fuel Line. 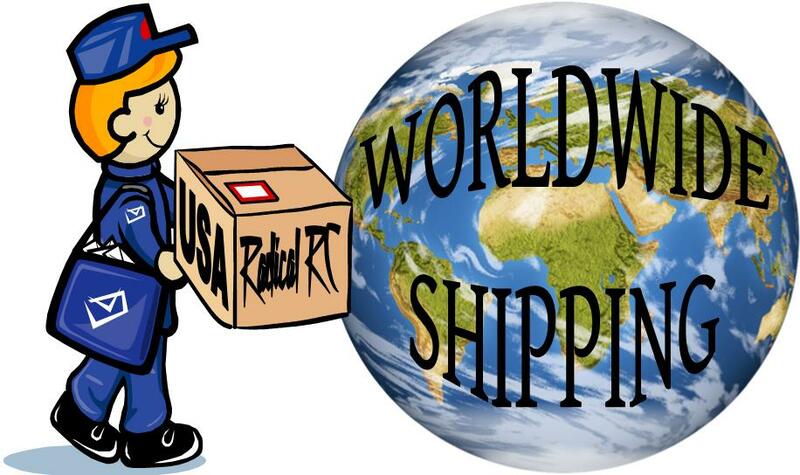 One pack, Radical RC Hot Pink, 2.2mm(.087")ID x 5.5mm(.217")OD x 1 meter(39")Silicone Fuel Line. One pack, Radical RC Yellow, 2.2mm(.087")ID x 5.5mm(.217")OD x 1 meter(39")Silicone Fuel Line. 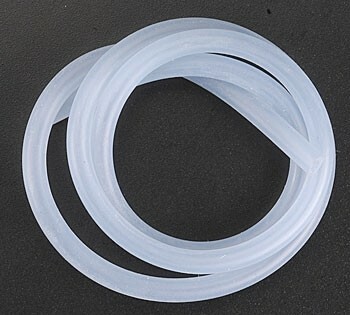 One pack, Radical RC Translucent White, Jumbo 3mm(.059")ID x 7mm(.098")OD x 1 meter(39") Silicone Fuel Line. Specially blended soft Nitrile tubing. Compatible with smoke oils, gasoline (unblended), and diesel fuel. Higher heat resistance than Tygon tubing. 3' of 3/32 ID tubing. Specially blended soft Nitrile tubing. Compatible with smoke oils, gasoline (unblended), and diesel fuel. Higher heat resistance than Tygon tubing. 3' of 5/32 ID tubing. Du-Bro Tygon Fuel Line 3/32 ID. Tygon fuel line is for gasoline and diesel fuel only. Won't crack or harden. 36" (.914m) length of 3/32" (2.38mm) ID line. Tygon fuel line is for gasoline or diesel fuels only. Won't crack and remains Flexible. 36" (.914m) length of 1/8" (3.17mm) ID line. 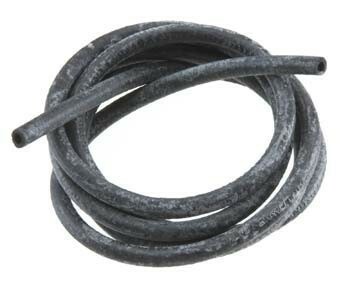 Du-Bro Large Tygon Fuel Line 5/32 Inch ID. Tygon fuel line is for gasoline or diesel fuels only. Won't crack and remains Flexible. 36" (.914m) length of 5/32" (4mm) ID line. 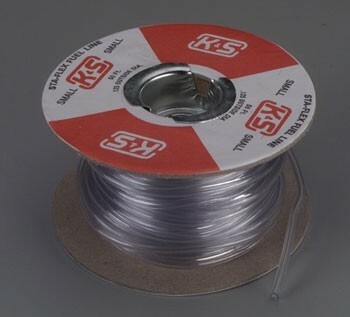 Clear fuel line for both glow gas and smoke fluids from K & S. ID: 1/16" (1.58mm); OD: .125" (3.17mm). Sold by the foot. Perfect for 1/2A and other small barbs. Enter number of feet as your QTY. 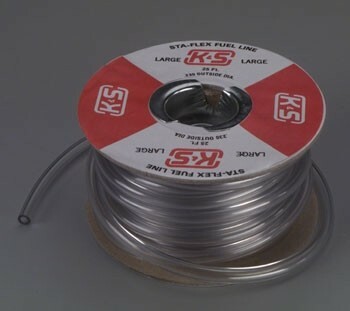 Clear fuel line for both glow gas and smoke fluids from K & S. ID: 3/32" .093" (2.38mm); OD: .190" (4.82mm). Sold by the foot. Perfect for 1/8" and 3mm barbs. Enter number of feet as your QTY. 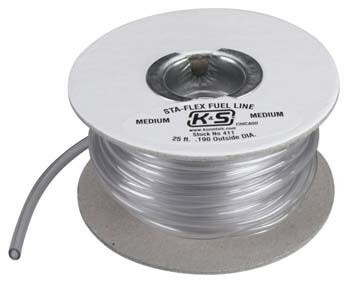 Clear fuel line for both glow gas and smoke fluids from K & S. ID: .118" (3mm); OD: .235" (5.97mm). Perfect for 5/32" or 4-5.5mm barbs. Sold by the foot. Enter number of feet as your QTY.